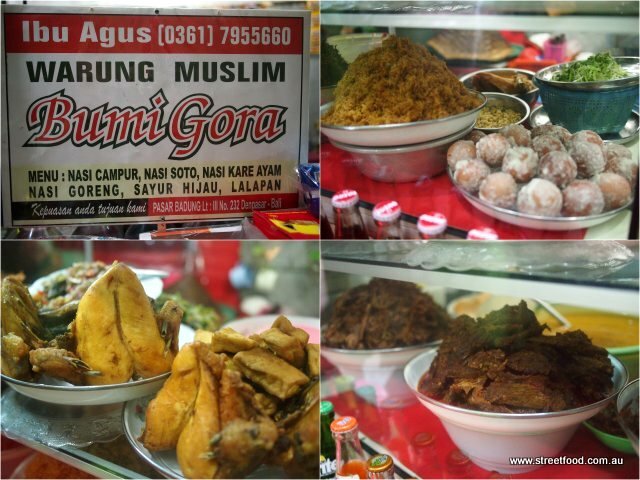 Alison allows Shawn to go to Bali unsupervised and check out what the locals are eating in the tourist ghettos of Kuta, Legian, Seminyak and Nusa Dua. Where there's mass tourism, there's a mass of local workers, and where there's local workers, there's local food. Sometimes Bali feels like a bigger rat race than the one I'm trying to get away from, but lordy there's some good food to be had. A favourite spot was this temple carpark next to the beach in Seminyak, popular with locals as they hit the beach at sunset. I'm superstitious about the first meal of a trip, it has to be a beauty, and this awesome lady delivers. Lovely satay skewars with rice cakes, the best bits were just charcoaled to the point where the sugars from the marinade caramelised and crunch-ified the outer bits. Yeah baby. Another visit was made to try tipat tahu, because I had no idea what it was. I knew tahu is tofu but I didn't know tipat is a rice cake cooked in woven coconut leaves, a simple stodge filler. It is served in a thick sweet peanut sauce, the lady tells me same-same gado gado. It's not amazing but it's filling and tasty. I imagine labourers and surfers chowing down on this calorie-fest after a hard day. It is washed down with es kelapa muda - coconut water and flesh on ice - delicious. All this was around $2 tops. The lovely tipat tahu lady from Lombok. Denpasar, Bali's capital, is not a particularly pleasant place but the market and surrounding streets are worth a look. The wet market area at Pasar Budung. There's some great food stalls on the top floor of Pasar Budung. We have nasi campur (pick'n'mix dishes on rice) in Sydney, but it is so much more artfully and delicately cooked in Indonesia. This crap photo (I quickly learn that hot humid weather fogs up camera lenses) simply cannot convey how incredibly, amazingly, freaking delicious this food was. The oh-my-god moment came from the chicken which Google tells me is ayam pelalah, shredded chicken with sambal and lime, sometimes called Balinese chicken. Equally amazing is the veggie dish which Google suggests is serombotan: a mix of greens, beansprouts and cocount. Also served with some noodles which seem really popular in Bali. I later tried ayam pelalah and serombotan in a tourist restaurant and it wasn't a patch on this. The trick is finding this stuff fresh. Another hawker stall at Pasar Budung. Sadly my visit was spoilt by a tout who shadowed me everywhere I went, nagging me to visit her stupid tourist batik stall. She wouldn't bugger off even after I paid her to do so, which got some belly laughs from fellow diners. I was planning to do a few visits to the markets in Denpasar but the tout experience drained me of desire. This lovely street food lady in Denpasar was an absolute sweetheart. Morning tea from the lady above, enjoyed while mesmerised by the Denspasar traffic: peanuts fried in a spicy batter; some kind of plain stodgey sweet; and a doughy, sesame seed ball with a sweet paste inside. Around 50 cents each. As I sat, ate and sweated buckets in the sweltering heat and humidity, a bunch of local teenage school kids jogged by in full tracksuits, none of them with a drop of sweat. Throughout the trip we notice locals wearing jumpers, jackets and even beanies in 32 degrees and 80 percent humidity, without a drop of sweat. Go figure. The beaches of Kuta/Seminyak are past their prime... made worse by the aggressive touts. But it's worth a visit just for the food. Look for the little stalls that cater to the local workers. I had the best luck hitting them mid-morning when the food was super fresh. I usually look for stalls run by tops old ladies, but these surfer dudes do a killer nasi campur. I went for veggie dishes in the morning. The tempe (cakes of fermented soybeans) were insanely good, perfectly cooked so it had a really nutty flavour and texture, I could have sworn there were peanuts in there but it was 100% tempe. The greens and potato were incredible, in the mix was some coconut and fried tofu puffs that soaked up the sauces and exploded in the mouth. One of the best feeds of the trip, all for just a bit over $1. Another great beach stall around Legion run by some lovely Muslim ladies around Legian. The food is amazing and at 1/50th or the price of the fancy pants hotels in the background. Another killer nasi campur: ayam goreng (fried chicken); serombotan (greens and been sprouts); and an amazing dish of peanut and coconut. About $2. Also serving the local workers are ladies getting around with a selection of goodies on foot, bicycle and motorbike. An afternoon tea from the snacky lady: a wee baggy of rojak (fruit in a sweet spicy sauce) and salak (or snakefruit). Snakefruit is awesome, reminded me of fresh lychee. A popular roadside snack all over Indonesia is bakso: balls of manufactured mystery meat in a simple soup. Dig this great bakso setup on the back of this dude's motorbike. I like the clever bakso device: the steam from the broth keeps the bakso and wontons warm. Bakso with tofu, fried wontons and a few noodles. Plain and simple. Very refreshing in the heat. Folks selling ready-mix nasi campur. It is served in triangle shaped paper packets. There's usually at least a couple of flavours to choose from, I always seemed to go for chicken. I kicked myself for not trying an egg one because I remember flipping out with joy on an egg one years ago. Doh! Nasi campur with fried chicken, veggies, noodles and an extra piece of fried tempe. A great breaky for about $1. Another nasi campur in paper, across the road from Maccas in Kuta. As I ate a lovely, ancient, toothy old local bloke sat down next to me for a chat. One of those magic holiday moments. We thought we'd try the tourist version of local food one night at Warung Mimpi in Seminyak. It looks pretty dang good. A lot of the dishes were the same as what the locals ate. It was nice but lacked the "oh my god" factor of the proper local tucker when you get it super fresh and early in the day. The sambal prawn dish was a winner, nice and sweet. The ayam pelalah and serombotan were ok but didn't come close to what I had in the market in Denpasar. Rendang was nice and rich and dry how I like it, though chewy. Big brother went for some ikan bilis (peanuts and dried anchovies), beef rendang and some corn fritters. Across the road from Warung Mimpi is this most unusual shop: a combined authorised money changer and purveyor of fine magic mushrooms. We didn't change money there. If there's one food loved equally by tourists and locals it's babi guling: suckling pig. We've known locals to shed tears of utter joy at the mere mention of babi guling, seriously. I thought babi guling couldn't be as good as I remember from my last trip, but it was, it really really was. The porky swine flesh is pretty darn tasty, but the pork sausage, crackling and fried mystery bits are heavenly. This 'special' on rice was around $3. So I had two of them. Big brother went for the big $5 deal, you get more of everything and rice on the side. ...plus a homely porky soup. While wandering the streets of Kuta looking for interesting worker food, I ran into this guy selling some grey kind of soup. It looked kind of disgusting so I ordered a bowl. It turns out to be one of my favourite feeds of the trip. The "soup" turns out to be sweet, warm coconut milk, with some clumps of sticky rice and what I'm told are peanuts. As mid-morning snack in the tropics, it's very hard to beat, it is very refreshing. I went in for this a couple of times. Another local feeding hole around Legian: Warung Nasi Darsana. Almost everywhere seems to serve nasi campur but the fixin's do vary a lot. Green beans, omelette, chicken and sambal prawn. Some Singaporean tourists told me they visit this restaurant here every day on holiday, I can see why. A bicycle food lady: selling coffee and snackages to workers in shops and restaurants. All the goodies are in small ready-to-go portions in plastic bags. A three-in-one coffee (coffee powder, milk and sugar in a sachet) and some pandan sweets for afternoon tea. Yay. Why is the Absolut Vodka bottle the vessel of choice for roadside petrol stations all across Southeast Asia? A fine warung of Seminyak. Soto sapi - a thin simple beef soup, with rice and 'Tehbotol' iced tea on the side. This cost around a couple of bucks all up. 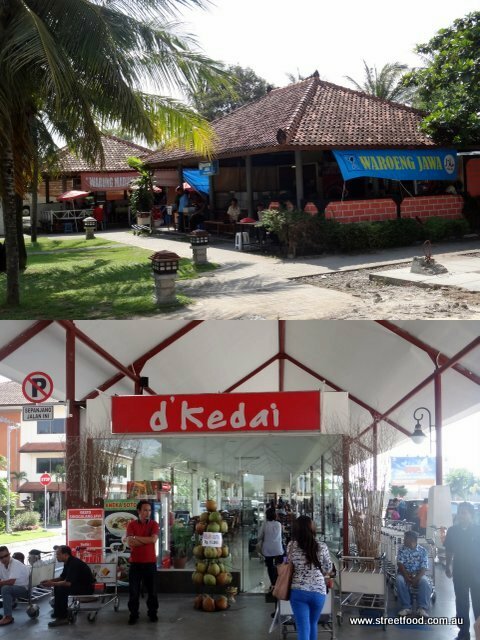 This little market in Seminyak looked promising at first, but was a bit dead. The footy we watched in the pub came from regional Queensland. Tigers lost but the ads made it worthwhile. I'm so going to the canteen at Roma Saleyards. Another great little Warung in Legion, tucked away off the main street. This is Javanese food but I'm yet to figure out all the regional differences. Super yummy crunchy fried chicken, greens, a most delicious corn fritter and some sambal fish that is so tasty that I don't share it with the pussycat under the table, and I'm quite a cat nerd. Another Indonesian favourite: es jeruk, orange juice with ice. It's made from Tang-like powder but with more of a mandarin flavour, with lots of ice it's delicious (nb notice the ice is tube shaped which means it is most likely manufactured and not going to give you Bali belly). Tube ice has magic cooling properties too. My big brother hits Nusa Dua for some surfing so I tag along as I'm very curious to see what food is around for the locals in this uber upmarket resort area. This little spot serves local workers and tourists. Kopi susu, coffee with milk. The Balinese coffee leaves a nice layer of sediment in the bottom. Ayam Bakso (chicken meatballs in soup) with extra fixins of dry fried onions, sambal and some kind of green, delicious herb. About $1.50. Rojak - I've had rojak in Malaysia and Singapore and never really cared for it, but I really go for this Indonesian version of rojak. The fruit is semi-ripe and crunchy. The sauce has nice fresh, sweet, tangy flavours - and a bit of a chili hit. Love it. Mee goreng - this version uses instant noodles. The resorts of Nusa Dua are stunning, beautiful and (I assume) prohibitively expensive. Around the corner from uber poshville is a beachside warung where the local workers eat. Gotta try this. On offer is (of course) nasi campur, served in a banana leaf. Noodles, peanuts, a little shredded chicken and some toasted coconut. This is really, really tasty. I like how they put in a little piece of leaf to separate the rice from the fixins to stop the rice going soggy. Mystery dessert #1 is a hunk of sticky rice, it's more salty than sweet. Mystery desert #2 takes home the trophy: some kind of rice cake filled with fruit. A fellow diner reckoned it was banana. Whatever it was it was delicious. My view as I ate lunch... The nasi campur, two sweeties and a small water cost me just over $1.50. I'd hate to think what they were paying for lunch at the swanky resort next door. There's squirrels everywhere at Nusa Dua. Wonder what they taste like? (Just kidding Miss Piggy). Even an the airport there's plenty of good eating to be done. But my belly is full and it's time to go home. Fabulous post, as usual! I love your pictures. Thanks for sharing your trip with us! I'm really looking forward to our Bali trip in July - just for the food really, the beaches look as terrible as ever and the touts (don't even get me started). And Mr Shawn, I bet you that chicken in your Nasi Campur was squirrel...just saying. Wait till you meet all the lovely beach hounds in Seminyak, met the odd pussycat too! gosh.. reading this it makes me realise how much i miss Indo! i was in bali last sept and ate my way around it! cant wait to head back again! Yah, tempeh is one of those things that's just never as nice downunder, it's amazing when cooked right. i think you've had more nasi campur than i have! and I am indonesian! LOL. great post, and i agree, the sucking pig is awesome! This was a really great post, enjoyed reading it! Made me wish I was more adventurous trying the local food when I went to Bali last year, at least there is always next time! Great post! Been to Bali over 5 times and never get sick of the food. Bamboo corner in poppies lane (cant remember which one as there is two) is a good cheap as chips favourite serving local dishes too. Love the photo of the mobile donut guy. A classic. I want to go back now. It's quite amazing how you dare to go straight to the street, as most of my Australian colleagues tend not to do so. Well as a general rule in Indonesian street: if the ice cylinder is clear it's usually save. Watch out for those using frosty large ice blocks as they're less sanitary. The b'fast treat containing "peanuts" is actually a Maduran green beans porridge, or Indonesian called it "Bubur Kacang Hijau Madura". The standard version of bubur kacang hijau version however is a heavily mashed green bean, uses purple sticky rice instead of white, and more on the sweet side compared with the bit salty Maduran's. The dough ball with sesame seeds is called "Onde-onde"; as with the sweet plain rice cake I'm not quite sure what it's called in Bali. You should try "dadar gulung" next time; a rolled pancake filled with coconut shreds in liquid palm sugar. Visit the market early in the morning and you'll encounter another kind of Balinese snack: Jajan Pasar, involving lots of different cake pieces thrown it together then bathed in liquid palm sugar, and shredded steamed coconut. "Tipat" is how Balinese called "ketupat"; a quite common carbo source in western Indonesia, Malaysia, and Singapore. "Bakso Ayam" or chicken meatballs is a favourite in Bali, since most Balinese don't eat beef, while elsewhere in Indonesia "Bakso Sapi" or beef meatballs is the most common meatballs. If you fancy hot food, try to look for Nasi Ayam Bali; there's one in Sanur Beach which is quite popular, including to foreign tourists. It's called "Nasi Ayam Bali men Weti". For something more challenging, try Balinese fish head soup :). Good luck on your next adventure! I have been to Bali 8 times over 20 years and never tried the local food on the beaches. we were there in late Sept early Oct. and decided it was time to try the local food as we never saw any sick Indonesians any where. After walking the streets of Kuta for a few days looking for somewhere suitable for lunch we decided to chance it and try the food from the stalls at the back of the beaches, what a surprise it was, very tasty, hot and as much as you wanted for next to nothing. We will be going back to these struggling locals and telling all our friends what they are missing out on if they don't try them.Made some great local friends and will definetelly be going back. Loved your blog! Stumbled across it and really enjoyed reading it, makes me wish for Indo food again, yum! This is great stuff...next time you're in Bali let me show you some local food surprises...in the dark heart of Denpassar there is a fabulous version of the famous Mexican soup known as Menudo...shockingly excellent. You inspired me to go eat local tonight! wow... nice post! indonesian food is the best! All these food photos making me hungry. Doesn't know there are so many variety of food in Bali. Going to try them on my next trip in May. Going to explore the streetfood after seeing yours. Nice blog, reminds me of my little street food adventures in Bali and around Indonesia... one thing I really liked - but difficult to get - was sate made from chicken tails. Did you never try it? It needs to be properly grilled, but if it is, it is hard to beat. Great blog post. inspired me to go out and get bakso tonight. was so good i had another bowl later on! I found this blow, when searching for Bali on Google. And i know i am a bit late, when looking at the blogging date... But i just want to say i really liked you're writing style! Is there some place else where you're write on? Thanks for the blog, this is the best blog for foodies and we are ready to hit the street in Bali! Will you be okay if we use these in our stories? The story will appear on our page here: www.skyscanner.co.in/news. Do let me know if you have any reservations, and I will be happy to not include the information. It will be most helpful if you could respond by 10th February. Hi there, sure you can use these, as long as you credit our blog and provide a link to us.